By using MyBlueEarth the average family of four will save 350 gallons of water a month. That is equal to 1050 Kilowatts of power and results in $20 in water and sewage use savings. Multiply that for a year and it becomes more tangible and relatively significant. Now multiply that by the number of families in America and then start adding other countries and the results become pretty staggering, really quickly. 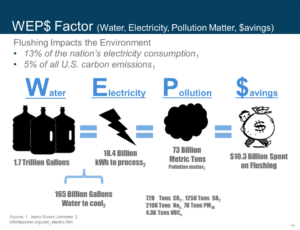 Now look at the cascading effect, which includes the reduction in water treatment power use, transportation fuel savings and significant reduction in water evaporation loss and you have a global shift that lowers our overall carbon footprint and increases the available water supply across the planet. All that from one simple act that will take less than a minute. See how easy it is to change the world.